Today’s spotlight is on Patel Conservatory voice instructor Stella Zambalis. Zambalis, a professional opera singer with more than 30 years of experience, recently performed in A Celebration of Carlisle Floyd at Florida State University. As an alumni of FSU and having worked with Floyd from time to time throughout her career, Zambalis was invited to perform at the concert held last month in honor of this American composer. 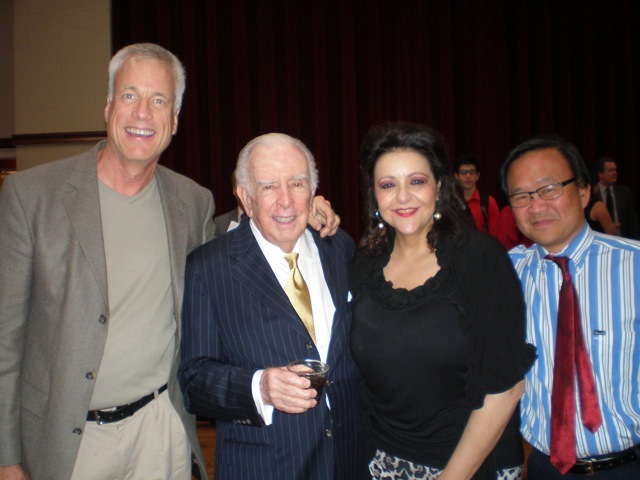 Opera composer Carlisle Floyd with his former students at the FSU concert in his honor. From left: Craig Bohmler, Floyd, Stella Zambalis, and Maestro Michael Ching. Floyd taught a workshop here at the Patel Conservatory this past summer as part of Opera Tampa’s V.O.I.C.Experience. Zambalis has been teaching voice at the Patel Conservatory for nearly two years. She grew up in Clearwater, and moved back two years ago from New York to care for her mother after being away from the area for more than 30 years. She’s performed with opera companies and on concert stages worldwide, and is the artistic director for the Bel Canto Recital Series. She is a regular guest for leading opera companies such as the Metropolitan Opera, the New York City Opera and the Houston Grand Opera. Many of Zambalis’ students come from throughout Florida, and even from New York and Tennessee for her specialized training. “I feel proud that people feel I’m the one equipped to help them with their career journeys,” said Zambalis. Zambalis feels that the two most important things for an opera singer are an ongoing voice teacher, and ongoing vocal coach. A voice teacher works on vocal technique, the vocal mechanism itself, while a coach works on style and knows the various musical nuances of different operatic periods, she said. At the recent concert at FSU, Zambalis performed a scene from the end of Act II of Floyd’s most recently written opera, Cold Sassy Tree. After the concert, Floyd himself complimented Zambalis’ singing and portrayal. I think Ms. Zambalis is world class! A wonderful performer and human being! None better! Conservatory student in today's Macy's parade! Don't miss Bruce Marks master class! Theater guest blog: Our Town this weekend!